IGC flight log generated by flying app requires consistency and proper file signing and closing. Use app EXIT function to properly shut down device after landing. Backup IGC flight log is also created by V6 hardware and as long ereader is alive, V6 will continue to log your position. There is vario shut down delay settings (check out Configurator page). This settings keeps vario alive for additional time (in seconds). If flying app freezes and requires restart, this will allow backup IGC logger to keep logging, even if ereader restarts. Ereader is running Linux distribution in the background and after EXIT from flying app it takes up to 10 seconds to shut down the system. After this time, vario module detects that ereader is OFF, and starts process of shutting down. You should hear 3 beeps just before power OFF. hold button for 1 second, switches vario/gps module into SDcardUSB storage mode. Vario/gps module stops processing data and waits for usb <> PC connection with usb cable. This way user gets access to backup IGC files. Turn V6 and wait for boot process to finish and flying app welcome screen. 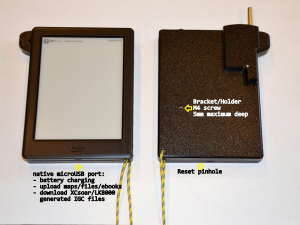 Click NICKEL (under XCsoar) or EREADER button (under LK8000) to switch to ereader mode. Ereader will shutdown and restart. It is important to put vario in USB storage mode, because if vario is in running mode (sends data to ereader), Ereader will freeze. It has to be then shut down hard way (holding button for 10seconds). There is Linux bootloader waiting for user input, when ereader restarts or boots up, so if vario sends gps data, ereader is waiting for proper commands. When ereader properly rebooted, it will show another Welcome screen. User can created account using Wifi option or No wifi option (by usb cable). When this is done, power off ereader, by holding power button for a second. Wait few seconds to allow ereader’s operating system to power down, and vario module to power down. Turn ereader again. Flying app will welcome You with Welcome screen. If ereader/vario is on, hold vario button for a second, so vario will enter SDcard usb mode (requires new firmware). This mode dismounts vario access to Sdcard and expose it over USB cable. Use usb cable to connect vario into PC and download backup IGC files. LK8000, XCsoar, TopHat Soaring are open source apps, ported to Linux distribution which runs behind the ereaders. do not delete anything from ereader, when ereader is connected to PC/MAC. All settings folders (LK8000,XCSoarData) will stay in place, and will not be changed by update process. You can make backup of these folders if something goes wrong. 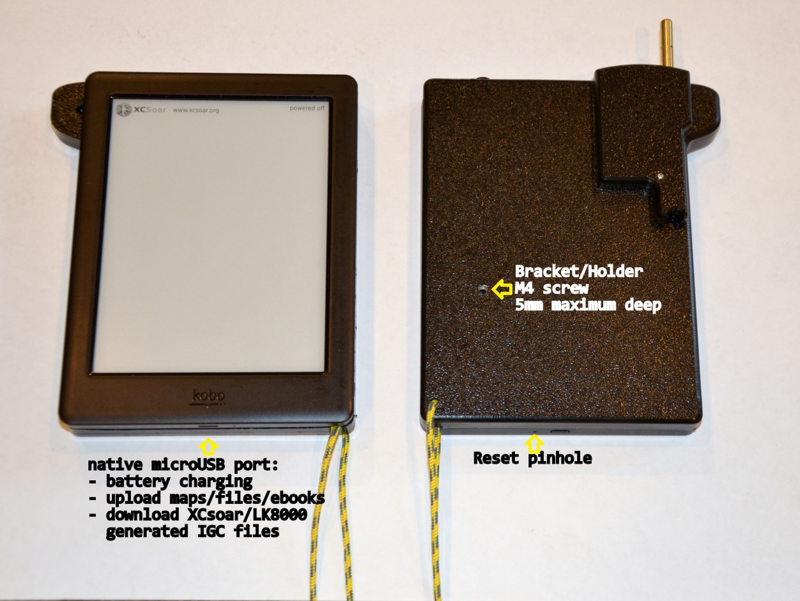 all ereaders have internal SDcard (no accessible to user from outside). We need to take apart ereader to get access to this SDcard, which is located next to the battery.Then we have to deploy new operating system into sdcard. This way ereader’s linux operating system is like freshly installed by factory. ereader will boot up, and vario will enter firmware update stage. Tiny flash drive will be mounted to Your PC. OLD content, work in progress. V6 is based on eink device and internal vario/gps module (vario). There is no terminal/monitor settings configuration like it used to be in previous GoFly Projects. Vario has default configuration loaded, and only if SDcard is inserted with configuration file /setup/variosetup.ini, these default values are overwritten by configuration from variosetup.ini file. GPSFIX indication LED is located just next to micro SDcard slot. If LED blinks, it means that GPS has discovered its position and UTC time is resolved. ereader runs tiny Linux operating system, and power on and off stage takes few seconds. Ereader powering OFF process might take up to 10 seconds, so when pilot exits flying application, it takes another few seconds to completely shut down internal Linux operating system. After that, vario module detects that ereader is OFF and also goes OFF. pilot can execute hard shut down by holding ereader’s button by more then 10seconds. variosetup.ini contains configuration variable [poweroff_delay=10]. It means that after vario module noticed that ereader is off, it takes additional 10seconds to shut down itself. If ereader is turned ON again, and vario is still in countdown mode, vario continues to operate. There are multiple actions mapped to vario button. It can be: clicked, double clicked, triple clicked, also long press has assigned function. If ereader is turned ON, and ground speed threshold is not detected yet from GPS, vario stays in quiet mode. With first single click, vario exits quiet mode and audio is enabled. If ereader is powered ON, and vario is running, single button click will change LIFT AUDIO VOLUME (lift beeps). Audio volume goes from 3 down to 0 (no audio) with every single click. Every volume change is confined with short multiple beeps sequence. If vario is running, double button click will change WHISPERER AUDIO VOLUME (beeeeeps around “zero” lift, when your sink rate equals raising air around You ). Volume goes from 3 down to 0 (no audio) with every double click. Every volume change is confined with short multiple beeps sequence. if airspeed related sensors are available, vario performs quick sensors calibration. This is required due to pressure sensor error offset. If eink device is powered on during flight, and there is already airflow impacting device, sensor calibration stage is skipped, and calibration value is taken from previous flight/power on cycle, when device was on the ground (not flying). when GPXFIX is established, vario sets local time from gps time and creates time stamped file on sdcard with firmware version information. Reading this text file will give pilot information what current firmware version is loaded into vario. vario creates time stamped IGC file on sdcard, for example 2017-03-02-XGF-PV6-13.igc with pilot information and starts recording pilot’s position, position timestamp, gps altitude,barometric altitude. There might be large difference in both altitudes, because barometric sensor is factory calibrated against seal level pressure. So if today there is different barometric pressure than yesterday, barometric altitude will be different. Countdown timer can be set inside /setup/variosetup.ini file located on sdcard . After countdown is finished, vario finalizes IGC file, signs with G records and shuts down. Vario also monitors heartbeat of eink device. If eink device hangs, after hard shutdown (holding power off button for 10secodns), vario will detect this state, and after ~5seconds will finalize IGC file, sign it and power off. NOTE: If countdown is set to large number (~30sec), then pilot has 30 seconds to quickly restart eink device to keep IGC file recorded by vario consistent. IGC log file created by flying app will be broken into multiple pieces, but backup IGC file created by vario will be complete and valid.